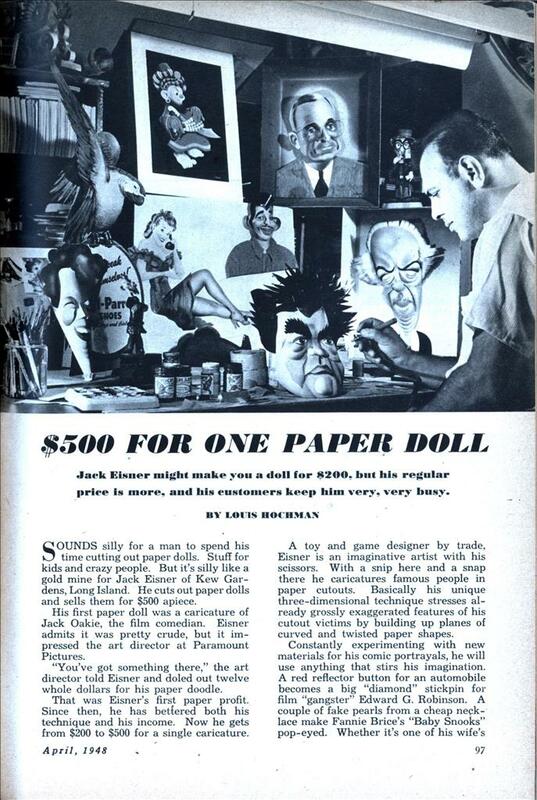 Jack Eisner might make you a doll for $200, but his regular price is more, and his customers keep him very, very busy. SOUNDS silly for a man to spend his time cutting out paper dolls. Stuff for kids and crazy people. But it’s silly like a gold mine for Jack Eisner of Kew Gardens, Long Island. He cuts out paper dolls and sells them for $500 apiece. His first paper doll was a caricature of Jack Oakie, the film comedian. Eisner admits it was pretty crude, but it impressed the art director at Paramount Pictures. “You’ve got something there,” the art director told Eisner and doled out twelve whole dollars for his paper doodle. That was Eisner’s first paper profit. Since then, he has bettered both his technique and his income. Now he gets from $200 to $500 for a single caricature. A toy and game designer by trade, Eisner is an imaginative artist with his scissors. With a snip here and a snap there he caricatures famous people in paper cutouts. Basically his unique three-dimensional technique stresses already grossly exaggerated features of his cutout victims by building up planes of curved and twisted paper shapes. Constantly experimenting with new materials for his comic portrayals, he will use anything that stirs his imagination. A red reflector button for an automobile becomes a big “diamond” stickpin for film “gangster” Edward G. Robinson. A couple of fake pearls from a cheap necklace make Fannie Brice’s “Baby Snooks” pop-eyed. Whether it’s one of his wife’s shoe trees for a nose, or a broken toy, a pipe cleaner, a bit of wire, a scrap of wood or cloth for some other caricatured feature, Eisner carefully hoards every old piece of junk around his house until he can put it to hilarious use in a bright new paper doll. Eisner can make paper do everything but talk. Many of New York’s Fifth Avenue shops feature his paper creations in their window displays, and advertising agencies often use his skill to dress up fancy pictures for color ads. Even the New York Museum of Science and Industry waived its no-art policy to exhibit some of Eisner’s comic caricatures. Highlight of Eisner’s artistic career, however, was when he cracked the upper crust of the art world by gaining recognition in the exclusive American Artists publication and getting his cutout caricatures displayed at the Gallery of Modern Art on New York’s high-browed 57th Street. A few samples impressed him, but he was still doubtful. Finally he agreed to try them in a brief exhibit. The short-order show ran for ten days and filled the gallery with record crowds. Bennet Cerf, noted author and publisher, saw the exhibit and had Eisner decorate his office with caricatures of his favorite authors, such as Sinclair Lewis, Quentin Reynolds, Cecil Brown and Eliot Paul. Before cutting out a paper personality, Jack Eisner first sketches an outline of his caricature on a sheet of tracing paper. For reference, he studies his file of news and magazine pictures of people in the public eye. In this sketch he also outlines characteristic traits that are to be cut out separately and added later as successive three-dimensional planes. Then he turns the sketch over and rubs the back of the paper with a soft-lead pencil so that he may transfer tracings of the sketch to heavy drawing paper. His pet tools are long shears and sharp knives. He has tried many adhesives but now favors cellulose cement which quickly dries clean and flows into corners to form a solid, waterproof bond. 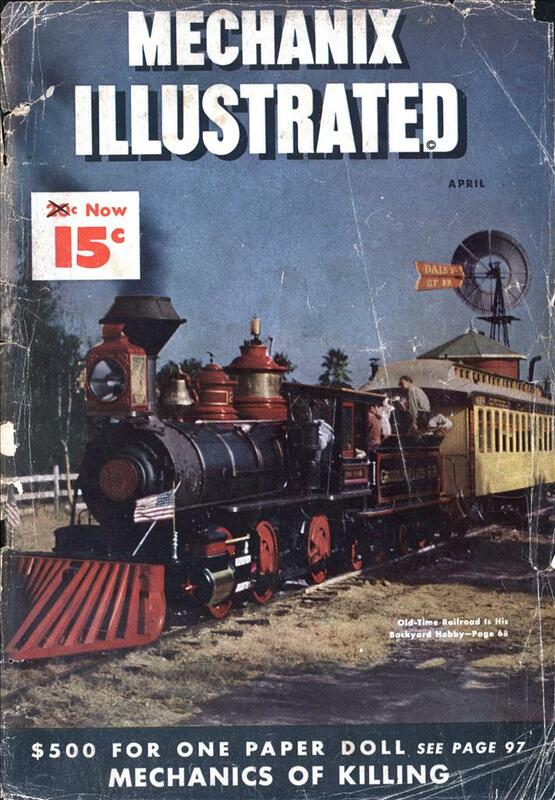 TVGuide had paper craft on some of the covers in the 1960s and 70s. wait, Jack Eisner? any relation to famous cartoonist Will Eisner?